Tolentino, 18 December 2014 – Arena, one of the world’s leading brands in aquatic sports, is pleased to announce the signing of a new sponsorship deal with Canadian butterfly swimmer Katerine Savard. 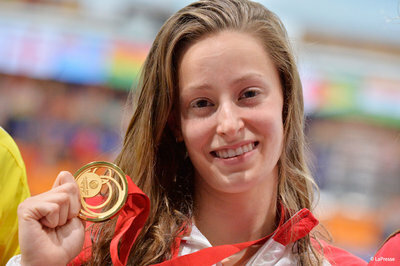 The 21-year-old from Pont-Rouge, Quebec, is the reigning Commonwealth 100 butterfly champion. Katerine started learning to swim at a very early age, and despite not liking the water initially, she was winning regional medals by the time she was 10. Continued success saw her break her first provincial record in 2008, make the Canadian national junior team in 2009, and the senior team in 2010. Her first national record followed in 2011. In her first senior appearance at a major international event, Katerine made the 50 and 100 butterfly finals at the 2010 Commonwealth Games in Delhi, and participated later in the year at the World SC Championships in Dubai. At the 2011 World Championships in Shanghai, she made the 100 butterfly semi-final, a feat she repeated at the 2012 Olympic games in London. In 2013 she won her first major international medal as she claimed the 100 butterfly title in record time at the Summer Universiade in Kazan, Russia. 2014 has seen more podium finishes as Katerine’s growth continues. At July’s Commonwealth Games in Glasgow, she won the 100 butterfly title, got through to the finals of both 50 and 200 butterfly, and picked up a bronze medal with the Candian 4x100 medley relay team. A month later on Australia’s Gold Coast, she and the Canadian team repeated their bronze medal effort at the Pan Pacific Championships, where she also made the 100 and 200 butterfly finals. Katerine finished off the year with 50 and 100 butterfly semi-final apperances at the World Short Course Championships in Doha.